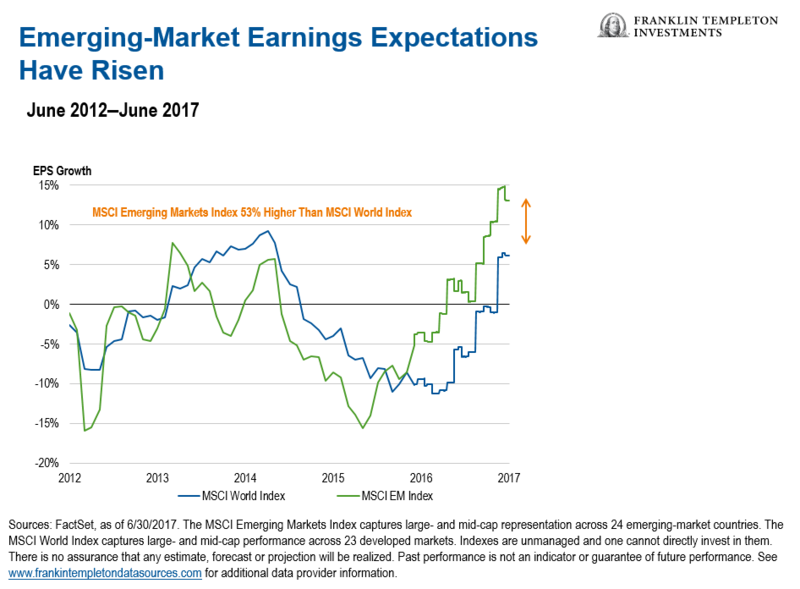 The first half of 2017 has been bright for emerging markets, generally speaking. My colleagues Stephen Dover, chief investment officer of Templeton Emerging Markets Group, Chetan Sehgal, director of Global Emerging Markets/Small-Cap Strategies and Carlos Hardenberg, senior vice president, director of Frontier Markets Strategies, examine factors boosting sentiment this year and point to some themes and sectors we are excited about in this space going forward. The strong start to the year reflects an improved macroeconomic backdrop following a period of currency and commodity price adjustments and widespread political change. The factors many investors have historically found attractive about the asset class have come back into play, including stronger earnings growth and robust consumer trends. While areas of risk remain, our view is that we are still in the early innings of the emerging-market earnings growth upturn. We also believe valuations and sentiment continue to be supportive. Even in regions that are still going through adjustment and rebalancing, we see more visible signs of robust underlying economic conditions. Positive factors include low debt, stabilizing commodity markets, reduced currency volatility and improving consumer confidence. The implementation of reforms in many countries has also been further driving market confidence. Importantly, EM corporate earnings growth hit an inflection point in 2016 after several years of decline, due in part to weaker commodity prices and slowing growth in China. Earnings growth now appears to be rebounding. Emerging-market corporations’ capital allocation and cost efficiency also have been improving, which we believe should support profit margins and lift return on equity. Taking a long-term view, the structural investment case for emerging markets continues to center around demographics (including a rising middle class) and domestic consumption. We think it’s also important to recognize that there have also been fundamental shifts in the corporate landscape. 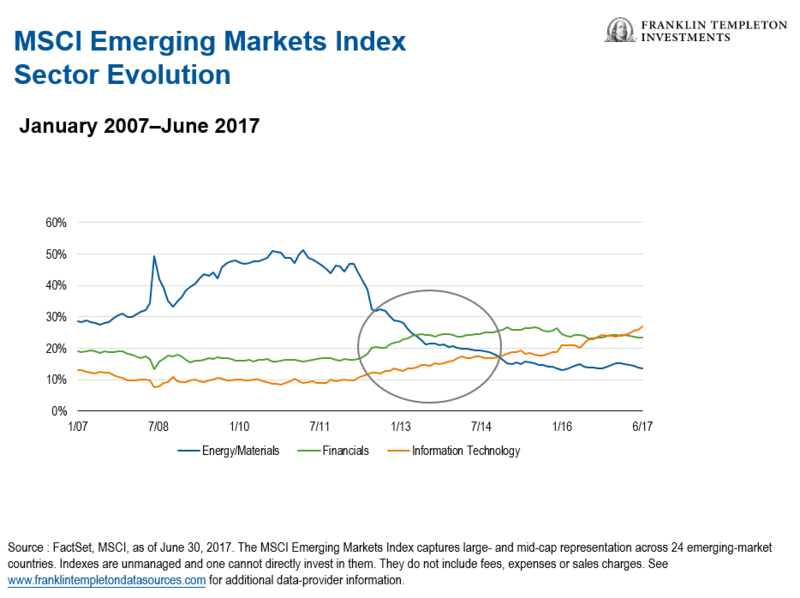 Emerging markets are more diversified than they were a decade ago. The asset class has undergone a significant transformation from the often plain-vanilla business models of the past. Older models tended to focus on infrastructure, telecommunications, classic banking and commodity-related businesses. Today, we see a new generation of highly innovative companies which are moving into much higher value-added production processes, or are on the cutting edge of world-class technology leadership. The rising importance of IT in emerging markets is a key transformation which has been taking place right under our noses for the past decade. This trend coincides with the lessening dependence on commodities as drivers of growth. IT now commands the highest sector weight in the MSCI Emerging Markets Index. This is a result of outperformance over the past two years as well as the rise of a number of large IT players (most notably certain Chinese Internet names), which were added to the MSCI EM Index in late 2015 and mid-2016. Today, a diverse set of companies in emerging markets are becoming leading players in the development of world-class technology. There are numerous examples of how EM companies are transforming many areas. One example is online shopping. China’s “Singles Day” is the world’s biggest online shopping day. Celebrated annually in China on November 11, the concept is similar to “Black Friday” on the day after the Thanksgiving holiday in the United States. And, innovation isn’t only confined to the largest companies. It’s happening at smaller, more niche-oriented EM companies as well. Our focus is on companies with sustainable earnings and a competitive advantage that in our analysis can survive longer than the market may think. While a recent retreat in IT stocks serves as a reminder of the market volatility that can occur, we remain constructive on the outlook for the IT sector broadly. Although we are cautious of the rapid share-price advances in select China-based Internet stocks, we continue to see value in the sector across emerging markets as a whole. The Chinese government remains focused on its “Internet Plus” strategy, wherein the Internet will play a key role in fueling China’s next stage of economic growth. There are also numerous opportunities for companies to expand locally. Of particular interest is attracting consumers from the country’s rural areas where more than 40% of the population resides. In addition to IT, the consumer sector provides an effective means to gain exposure to EM economic expansion, and access to growth in spending as rising regional wealth fuels a burgeoning consumer population. Classic EM consumer companies operate in areas including autos, food and beverages, and clothing/textiles. Middle-class consumers in emerging markets are not only demanding these type of goods, but also are increasingly demanding services including banking, health care and leisure (entertainment, resorts, movie theaters, gaming and travel). The rise in the services sector in emerging markets is consistent with what we have seen across developed markets as income rises. We also think this area represents an interesting investment opportunity currently, as it tends to be more domestic in nature and thus less exposed to trade policies and currency volatility. In many emerging economies, we have seen an influx of luxury brands in particular, catering to the rising affluence of the middle class. While China’s slowdown in economic growth has weighed on emerging markets for several years, many observers had clearly been overstating the risk of a hard landing. China’s growth appears stable so far this year, and the economy is now experiencing reflation with improving external demand. On the structural side, we have seen positive results from the reform of state-owned enterprises (SOEs). Many of these companies are now seeing stronger cash flows and an improvement in their balance sheets. China also still enjoys several important credit strengths, particularly a large and diversified economy, robust growth and a high domestic savings rate. Although the country still faces a high level of debt, it is generally contained domestically, not externally to a creditor. Moreover, China maintains a substantial current account surplus, and the government is also working to contain financial systematic risk with proposals of tightening regulations on shadow banking activities and closure of “zombie” SOEs—companies which are highly indebted and poorly performing. Looking ahead, the main drivers for Chinese equities we see include an improving earnings outlook, higher cash returns (dividends) to shareholders, a fading risk of currency devaluation and further implementation of supply-side and SOE reforms. Areas of risk to watch out for include adverse changes in US trade policies, faster-than-expected interest-rate hikes in the United States (which could lead to a stronger dollar), rising political tensions with South Korea and Japan, and higher bond default rates if systemic liquidity tightens. The major investment themes for us are along both structural and cyclical fronts, and they include Internet technology and e-commerce, luxury-consumption (for example, autos and casinos), mass consumption, commodity-price recovery and supply-side reform, and structural growth. We believe the continued improvement in emerging-market fundamentals should be supportive for equities. Earnings growth trends improved markedly during 2016 and the early part of 2017. We expect this turnaround to likely continue, with economies and corporate fundamentals across the asset class also likely to continue stabilizing. Nonetheless, we are mindful of potential volatility and remain watchful for risks. US monetary policy shifts are still a source of apprehension for many market participants. We expect US interest-rate increases to be gradual, but caution that larger or faster-than-expected rate hikes could dampen sentiment and lead to market volatility. Other risks to our outlook include uncertainty about the new US administration’s policies, as well as the ability of China to continue its growth while making structural adjustments. That said, many emerging markets have strong reserve positions and lower external debt today than they’ve had historically, which makes them less vulnerable to external shocks. In sum, we see many reasons to be optimistic about the outlook for the asset class in the remainder of 2017 and beyond. 1. Through June 30, 2017. In US dollar terms. 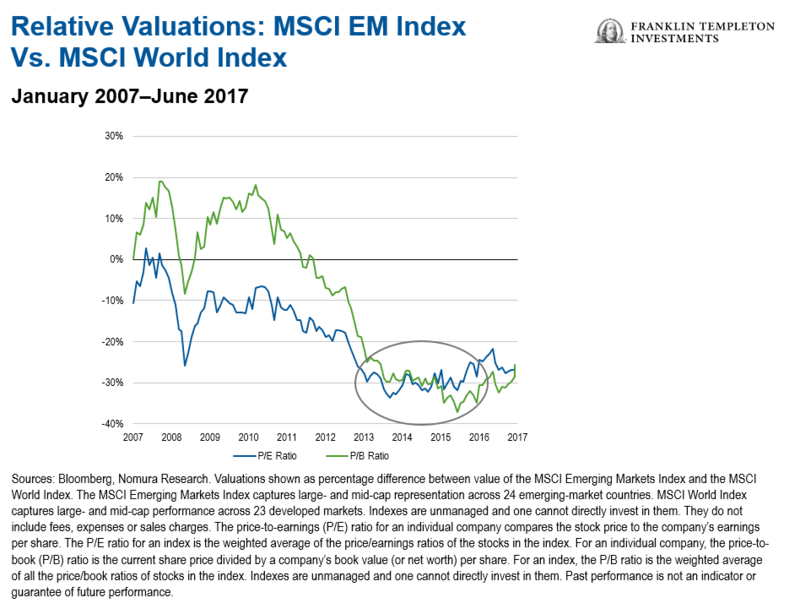 The MSCI Emerging Markets Index captures large- and mid-cap representation across 24 emerging-market countries. The MSCI World Index captures large- and mid-cap performance across 23 developed markets. Indexes are unmanaged and one cannot directly invest in them. Past performance is not an indicator or guarantee of future performance. 2. Source: FactSet. Though June 30, 2017. See www.franklintempletondatasources.com for additional data provider information. 3. The P/E ratio for an individual stock compares the stock price to the company’s earnings per share. The P/E ratio for an index is the weighted average of the price/earnings ratios of the stocks in the index. Indexes are unmanaged and one cannot directly invest in them. Past performance is not an indicator or guarantee of future performance. 4. Source: Gartner, IC Insight, JP Morgan estimate. 5. Sources: Bloomberg, TechCrunch. Data as of 2016. 6. Sources: Bloomberg, TechCrunch. Black Friday online sales US$3.3 billion, Cyber Monday US$3.45 billion and Thanksgiving US$1.9 billion (total was for the period from November 24-28, 2016).